Having visited Venice a few times since 1998, I finally treated myself to the pleasure of my own personal “Florian experience,” during my last painting trip to the city, in 2016. The timing was perfection, as two days after writing the above words in my travel diary, I had breakfast at Caffe Florian. I was indeed to enjoy Venice, beautifully. That morning, I dressed myself as was befitting for the occasion, with a colorful and silky dress. As the city awoke, I boarded the vaporetto from my hotel near the Basilica dei Frari, accompanied by locals who seemed to be headed off for a day’s work. I too was heading to work, in a certain way. I was to dedicate my day to painting a watercolor for one of my trip’s patrons. I arrived at Caffe Florian, just as it was opening its doors. I was warmly greeted and welcomed to sit anywhere I pleased. I walked around taking in the refined elegance of the interiors before selecting my table. I chose a seat that was in a corner near an open door looking into Piazza San Marco. From here, I could look outward at the piazza in one glance, inward at the cafe in another; my enjoyment drifting between the sights and sounds of both. I ordered tea, a small plate of macarons, and a strawberry cake. Could one have dessert for breakfast? The question barely crossed my mind at the time. My waiter soon arrived with a silver tray served with my chosen delights. I feasted first, on the presentation itself. The colorful plate of macarons arranged as if an artist’s culinary color palette, complimented by the delicacy of the strawberry cake. The silverware, befitting for the delectable treats to be savored slowly. 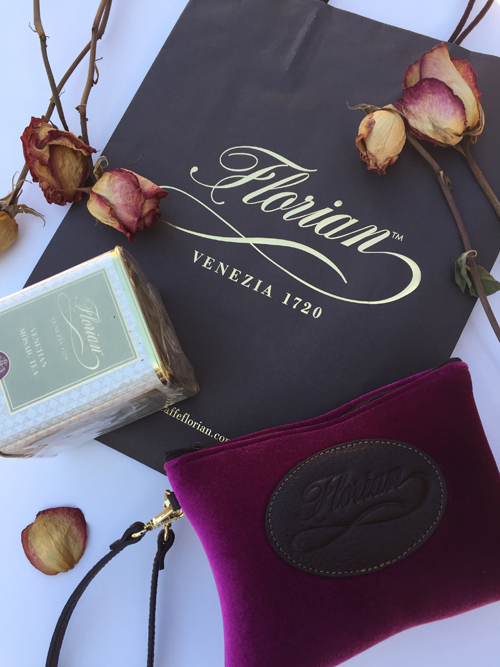 As I dined at Caffe Florian, my time felt like a brief yet deeply enchanted and romantic moment in the vastness of time; the near 300 years that the cafe has been welcoming its guests from Piazza San Marco. Can a place feel both opulent and welcoming? Can an experience be both majestic and personable? I feel that much of Venice and certainly Piazza San Marco has these qualities. Caffe Florian felt like the “icing on the cake” with which the city served this unique blend of experiences for me to enjoy my very own taste. Before leaving the cafe, I gave myself the added treat of visiting the gift shop. With the help of the kind gentleman who worked there, in a room that felt like a treasure box of delights, I selected a few teas and a blue damask tote. Each gift was carefully packaged into its own gift bag; a gesture celebrating and recognizing the uniqueness of each treat, as well as the care with which each was selected. I do believe that mornings are a precious and tender time of the day, and that they set the tone for what is to come throughout the rest of the day. Unbeknownst to me, my breakfast at Caffe Florian would lead to the most enjoyable painting session of my painting trip. The warmth and ambiance I experienced at the cafe mirroring themselves in the fuchsia and orange watercolor pigments I was to later paint with. Every now and then I treat myself to this touch of Florian hospitality through their e-shop. The latest to arrive are their Venetian Mosaic tea, a long time favorite, as well as an elegant pouch in a fuchsia color reminiscent of the cafe’s upholstery. With this, I carry the beauty of my “Florian experience” with me every day. If you enjoyed reading this letter, you can receive future “Letters from my Art Studio” by signing up here. There is a place in Italy that once felt like a secret to me. Not just a secret that Italy kept. But one that I felt in some ways, I also kept. It is a series of cave dwellings, deep in the south of the country, that I traveled to on a bus through miles of - 'I don't know where I am'- to get to. And I arrived in the town with that same feeling of being somewhere that was both mysterious and other worldly, while at the same time it beckoned me nearer and nearer. I have had the good fortune of traveling to these caves four times, so far. Four precious encounters. With each visit unraveling more and more of the mystery, and deepening my sense of nearness to it. I might also say that each visit signified a different stage in my life. It is a place that has a story, a history. It is a place where I had the most precious, memorable, and tender encounters with the locals then that in all of my travels through Italy and beyond. I will hope to share more of my art and these stories with you in a future letter. For now, I wish instead to perhaps leave but a glimpse, a tiny sliver of my experience there, just as the town had first revealed itself to me. And it is no coincidence, I feel, that at the same time that I am reminiscing about my travels to these caves, that I also spent a few days at a monastery. A former monastery which has been converted to a learning center. There is something primitive about both. Something stripped of both unnecessary outward possessions, but also unnecessary inward longings. It is within such emptied places, that we make room for certain things to be revealed. I will admit that this letter may perhaps seem a bit cryptic, or outside the lines, in comparison with others that I have written. But, I always do write here what is true for me, and right now this is where I am. And writing is a way for me to capture, deepen, honor, and share wherever it is that I may be. Even more so, the creative life for me is one that is closely tied to my inner, or spiritual life. The workshop that I attended at the former monastery, the Garrison Institute in New York, was about the poetry of Rumi. But....just like the caves, just like the Sassi of Matera, and many of my other travels, the outward form is but the invitation, the initial opening. It is often the case that the outward appearance of a place is what beckons us to it. But if we have even a sliver of a deeper yearning, we are shown that which deep down inside of us we long to know. If you are a traveler, in whatever way you might describe travel, or if you are a seeker, in whatever way you might describe seeking, I hope that perhaps this letter can be an invitation. An invitation to take a moment to remember a place that holds special meaning for you. And to bask again in the gem that you may have been gifted along your own winding and beautiful path. Until next time, wishing you peace, joy, serenity and the warmth of loved ones near & far. If you enjoyed this letter and would like to receive future Letters from my Studio in you inbox, you can subscribe here. I hope that the beginning of 2019 has been a beautiful, joyful, and love filled time for you and yours. And I hope that the serenity and hope that filled your heart at the coming of a new year, continues to be with you throughout this year and beyond, and that it bring you an endless abundance of gifts. Andrew Harvey, a mystic writer and teacher, is someone I have been blessed to learn from. In one of his online teachings, he shares an exercise in which we were to write about (10) moments in our life, in which we experienced awe. We then wrote the specifics about how this awe was experienced, and what this awe was telling us that makes us so excited. It sounds fairly simply, but upon such deep reflection on those moments of awe in my life, I was able to go quite deep into a well of knowing and appreciation of the true gifts within each of those moments of awe. Moments that I would otherwise gloss over in my memory. It came to me as no surprise, that many of those moments in my life were experienced during my travels. And whether you have been reading my letters for years, or are new here, you likely will know the affinity, the reverence, and the passion I have for travel. For me, that does not mean I have to travel often. Rather, it means I have to travel well. One way in which that materializes for me, is that I often only visit one city, no matter the length of my stay. I enjoy immersing myself slowly into a new culture, and trying to experience it as if I was living there, not just passing by. Several letters ago, some time after returning from my trip to Paris, I touched upon how I would not be painting and sharing my work as often as I typically did. This turned out to be a good thing for two reasons. One, being something that I hope to share in the coming months, and the other being that it has given me insights into seeing my work in a larger context. One example of that is a deeper sense of gratitude towards the places that continue to inspire my art, not the least of which is the city of Venice. Sadly, I am seeing and reading about many ways in which the city is being threatened. From it architecture, be it the cruise ships causing detriment to fragile foundations and walls, or flooding during high tides, to its culture and the livelihood of the Venetians, be it mass, and sadly often insensitive, tourism, the rising cost of living, the closing of small shops that cater to locals, and the lack of work opportunities to encourage younger generations of Venetians to stay within the city. Much of this I have come to learn of, through the twitter account of Dream of Venice. Being that much of what is harming the city of Venice results from mass tourism, I cannot help but feel that if I return I must somehow earn my right to do so. I do not know exactly what that means for me right now. But what I do know and what I can do is help to fortify the city, in my own minuscule way, through supporting the work of Save Venice, a nonprofit which has been working on architectural restoration and art conservation projects throughout the city. If you are a collector, your support has helped enable me to become a member, so I am very grateful for being able to play my small part. In my next letter, I will share another place in Italy that I am passionately painting. It happens to be a bit off the beaten path. It's a place I haven't spoken about or painted very often in the past, but it is strangely very close to my heart. I will look forward to sharing with you. If you enjoy reading my letters, you can receive yours by signing up here. Here it is...And it only happens once a year. My holiday special on art including Original Watercolors, Limited Editions, and Greeting Cards. It's the start of the holiday season, and for me it's a lovely time to celebrate life; a time of hope, wonder, family, warmth, laughter, and lots of beauty everywhere. So if you'd like to treat yourself or a loved one to some beauty from my studio, I would love for you to enjoy this special. The above watercolor takes me back to a time of wonder, beauty, enchantment, and the kindness of others, which I experienced in my last painting trip to Venice. If it would delight you to own this piece, please send me a message through my ‘connect’ page, and I'll share the details. Wishing you a most wonder filled start to the holiday season, filled with much love, joy, beauty, and laughter! This month marks a special time for me, as an artist. It is my five year anniversary of being an 'artist-preneur', as we've taken to sometimes calling ourselves. The rewards of having chosen to embark on this path are many; some are outward, many are inward. After my very first year as a working artist, I had written about the many gems of wisdom I gained, on the beautifully nourishing website of Carrie-Ann Moss, Annapurna Living, which can be read here. If you happen to read it, I would love to hear your thoughts, if you are so inclined to share. Many of you will know that the architecture of Venice, and of many other Italian cities are my very favorite subjects to paint. For me, these places represent an art, an aspiration which I feel is, for the large part, lacking in modern times. I look to the Pantheon in Rome, to the Duomo of Florence, and to many of the Gothic cathedrals in Europe. In the expanse of their magnificent domes, I see a representation of the grandeur of the human spirit and its aspirations towards something greater than itself, towards the divine, and towards ideals and perfect form. These structures also display attention to details as seen in their intricate stone carvings, and harmonic proportions as evident in the geometry of their plans and elevations. While these all give a wonderful sense of scale in relation to the human form, the magnificence of their domes allow the human spirit to soar. For me, these ideas are far more enriching than the question of who can build the tallest skyscraper standing today. This sense of grandeur is not only evident in churches and cathedrals throughout Italy, but also in experiences such as drifting along the grand canal in Venice at nightfall and catching glimpses of the opulence behind the facades of palazzi. The above watercolor is one in which I started experimenting with this idea of grandeur through my memories of traveling to Venice. And because I have been finding so much joy in painting these 'watercolor petals' I have a small offering. If you would like to purchase artwork from my online shop, be it a limited edition print, an original, or a set of notecards, I will also be painting a small 'watercolor petal' to gift you, as a delightful treat. I will be offering this for the next five days. I hope you enjoyed reading this letter, and thank you for being here. May your day and weekend ahead be filled with much beauty, wonder, and joy. It’s been awhile since I last wrote and I am thrilled to be back in studio painting away at one of my new favorite subjects, the enchanted city of Paris. Paris....what can I express in words about how much this city has gifted me. There are parts within me, parts within the deep corners of my soul and of my being that the adventure of traveling sheds love onto. Paris filled many of these places within me with an ever expanding sense of wonder and a romance with life. Beautiful. This exquisitely expressed sentiment from his Book of Hours: Love Poems to God reminds us to celebrate the very mysteries of our lives, of who we are, and of the endless stream of love, possibilities, and wonder that are inherent within each of us. And I do believe this is what some of the greatest works of art have the ability to do. I painted a love letter to Venice. With Mayan Dark Blue, with Carbazole Violet, with Burnt Umber, and iridescent gold. The colors spoke to me of a dream....a dream in which I found myself in Venice. There I was, living a fully abundant and colorful experience, beyond anything familiar, beyond anything expected. Yet, at the same time that the dream told of a world beyond, it all felt so familiar and real, almost as if I had already accepted the invitation of the visions that had come to me in this dream. And all I had to do was awaken to it. And that is what this watercolor reminds me of. It takes its inspiration from something real, something beautifully designed and built, a place that one can touch, feel, and visit. Yet, there is an air of enchantment in adding new colors, new brushstrokes, and in rendering this historic palace in a light that celebrates endless possibility as something attainable, not only in dreams but in our very world. There are times when a painting paints itself. If you have indulged in any creative pursuit, you may relate. Some call it the muse. It works something like this. You show up. You do your part: you lay paint to canvas, pen to paper, fingers to piano, etc. and then something greater than you joins you, and works through you to create the final piece. One of the many reasons that I enjoy painting in watercolor is that it allows for this magic to occur at a higher frequency, if you will. This is because the medium lends itself to spontaneity and unexpectedly surprises and delights. One of the things I enjoy about the above watercolor is how an imprint of the plan, or map view, of the Grand Canal appeared on the surface of the Grand Canal itself. It is something I had been considering before I began the painting, but had put the thought away. To my delight, it appeared "on its own." I'd like to think that it was one of those moments where a painting tells the artist what it wants to be. Sometimes it is in retrospect that we find the hidden gems of meaning in why certain things happen in our lives. It is often like this in travel as well. Days, months, sometimes years after I have embarked on a journey, I come to know more fully what the real gift in that adventure was for me. But Paris.....Paris was not like this. In the exquisite richness and details of the streets of Paris, I was gifted with the blessing of gratitude; gratitude for all my life experiences up to now. I realized a lot about myself and about my life, and deepened my appreciation for the details of my life's journey. All in the backdrop of the beautiful details of Paris. For me, the above watercolor is a celebration of just this. I enjoyed painting this door handle several times. When I fall in love with a subject I often paint it more than once. The second time I painted it, I enjoyed some of my new Daniel Smith watercolor tubes. (If you are an artist and would like to know the colors I used, simply message me). Something so simple as switching out some familiar colors with new ones, can lead to such excitement and renewed creativity in the studio. I highly recommend it to all painters! I may offer open edition prints again at some point, but for the foreseable future I will be saying farewell. Also a reminder that I am currently offering gift wrapping for the holiday season, with your order, which may be purchased here. The above work in progress watercolor is of the beautiful royal Saint-Chapelle in Paris, situation on the ile de la cite, not too far from the Cathedral of Notre Dame. This Gothic style chapel has a series of stunning stained glass windows, all depicted biblical themes, and meant to be read sequentially as a story.